Although I love our hometown, we do happen to live in the most landlocked county in England, so visiting the coast for the day requires embarking on what we call ‘a bit of a trek’ – at least by the standards of our small island. The good thing about the drive to our nearest coastline of Norfolk however, is that the route is almost exclusively country roads with none of the grey, anonymous motorway travel. You experience, by necessity, the changing British landscape as you journey out of central England and towards the East Coast. The gently undulating farmland flattens into the wide vistas of the Fens, the constant roadside companion of the River Nene is overtaken by the Great Ouse as they both race towards the Wash, and as you get closer to the coast you start to see gorse in the hedgerows and stands of majestic Scots Pine in reddish, sandy soil; the changing landscape itself becoming part of the adventure, with its own stories to tell. The road gets lonelier, with settlements less driven through and more glimpsed in the distance; small, isolated hamlets nestled amidst the vast, open landscape of the fens. This is the ancient landscape of the Britons, and steeped in legend. As early as Saxon times it was thought to be a wild, untamed place – a place of ghosts, strange creatures and Will-o’-the-wisps – and it still retains a mysterious, ethereal quality. It doesn’t take much imagination to picture an eerie mist rising from the once-damp marshland, shrouding wraith-like figures and curious beasts. One such beast told to haunt the Fens is the Black Shuck, the apparition of a huge, shaggy black dog with blazing red eyes who prowls the darkness, making no sound except for its blood-chilling howls. The name ‘Shuck’ is thought to have derived from the old English scucca or sceocca, meaning evil spirit or demon, and sightings have persisted for hundreds of years in varying detail. Sometimes the beast is reported to be headless, sometimes floating on a swirling mist. There are even reports of the creature being more benevolent, a protective presence with large green eyes instead of devilish red ones, but there remains a lasting myth that sighting it foretells the witness’s imminent death. The Norfolk coast is another favourite haunt of the mysterious creature, and it is thought that the Black Shuck may have been the inspiration for The Hound of the Baskervilles after Sir Arthur Conan Doyle heard the legend whilst holidaying in Norfolk in 1901, although if true, it’s not known why he changed the setting of the tale to the landscape of Dartmoor. The small, historic coastal village of Blakeney, Norfolk was our destination for the day, and it has its own fair share of Black Shuck sightings; one witness reported being followed by a huge, silent black dog as she pedalled furiously away from it on her bicycle, only for it to suddenly vanish, another saw it floating above ground level on an old road that may have once been an iron-age track. One woman was followed on her walk home by the sound of dragging chains for which there appeared to be no cause. The sound seemed to pass down ‘Back Lane’ which is a known haunt of the beast and, realising she might be in the presence of the Black Shuck, she wisely fled. Blakeney however, is home to more tales than that of this ancient cryptid; local folklore also tells of the elusive ‘Hytersprites’ – long-legged, spider-like creatures that kidnap naughty children who stray on to the saltmarshes, although one has to wonder how much of this legend is merely a cautionary tale. Blakeney is a beautiful place, the view from the quay when we arrive is one of desolate beauty – saltmarshes stretching for miles with a low, brooding sky overhead, framed with the masts of sailing boats – but you can imagine how deadly it could be to anyone wandering off without keeping an eye on the tides. When we arrived we made use of the main car park on the quay, but even this is tidal, and you must plan the length of your stay in accordance with the local tide chart, lest you lose your vehicle to the sea. During the medieval period Blakeney was a prosperous commercial sea port and was home to the trade of salt fish, spices, oriental cloth and, of course, smuggling! From as early as the 1300’s and well into the 19th Century Blakeney was reputedly a hotbed of smugglers and nefarious activity, with nearby Cley harbour supposedly being run by organised gangs of pirates. To this day, legend tells of a network of tunnels running below Blakeney, and not only are they the haunt of smugglers, but also a ghostly fiddler and his dog. 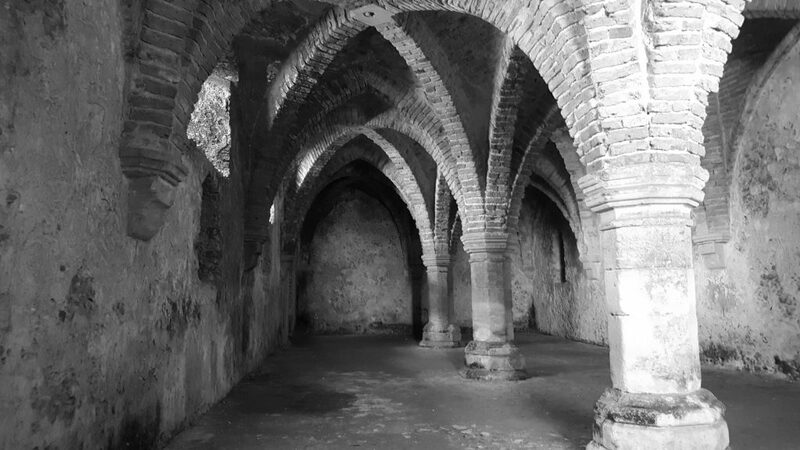 The story goes that it was widely believed the network of smugglers tunnels had many secret entrances and exits, one of which was reportedly located in Blakeney Guildhall and one in Binham Priory, which has a long history of being haunted by a ghostly monk. In more recent years one woman told the local vicar how she had seen the Benedictine monk appear wearing a black cowl. She watched the apparition form, then proceed to walk slowly along a ledge the length of the church (that used to make up part of the former priory) before disappearing. It seems the sightings of this monk have been around for a long time, as one version of the ghostly fiddler tale begins with a man volunteering to explore the tunnels below Binham Priory, to investigate the ghostly monk that appeared there. He played his fiddle so the onlookers could track his progress as he travelled through the tunnels with his faithful dog by his side, but suddenly the sound died. It seems the dog escaped, emerging terrified and shaking, but the fiddler himself was never seen again, and was presumed to have been taken by the phantom of the black monk. Another version of the tale has the fiddler begin in Blakeney Guildhall, where he volunteered to explore a passageway suspected to be the famous smuggler’s tunnels that had been unearthed, but the story ends in the same way. Whether Binham or Blakeney was the original location of the tale is lost to history, but they both seemed to have staked a claim; Binham naming ‘Fiddler’s Hill’ after the legend, whereas Blakeney boasts the fiddler and his dog on the village sign. In 1933 workman digging in the area between Blakeney and Binham unearthed the skeletons of two men and one dog, so perhaps these were two separate incidents after all, and only one dog survived. It is said that the eerie strains of the fiddler’s music can sometimes still be heard at night. Blakeney Guildhall is a bit of a mystery in itself and despite the traditionally-used title of Guildhall nothing much is known about its early history. It is thought to have been built by a wealthy medieval fish-merchant and was once a two story building. On a map of 1682 it is shown with a castellated upper storey, but all that remains of it today is the 14th Century brick-vaulted undercroft, which is now in the care of English Heritage and open to the public. The Guildhall is tucked almost into the side of ‘Mariner’s Hill’, a prominent man-made earthen mound thought to have been constructed in medieval times to be used as a harbour lookout point, that is easy to spot from the quay. The building itself is grey and stern-looking from the outside, built from local flint and stone, with the remains of the upper storeys jaggedly protruding from what is now the roof. The side of the Guildhall next to the mound of Mariner’s Hill. Stepping inside it takes a moment for your eyes to adjust to the gloom, as the only light filters in from three small windows, high up on the left side of the building in the shadow of Mariner’s Hill. When you get your first glimpse of the cathedral-like vaulted ceiling however, it’s difficult to remember that this was originally built for storage. In our present age of architectural utility, the design seems too grand for a space intended to store fish. The room is divided into two aisles by octagonal stone pillars, and on both sides there are deep niches cut into the walls, which are window-shaped but serve no purpose as windows. It is reported that traces of wall paintings could once be seen – although none survive today – all adding to the enigma of the structure. It is believed that the Guildhall may have once been owned by the Carmelite Friary that stood nearby, and that this Friary was actually were the mysterious tunnels ran to. The room certainly has an almost ecclesiastical feel to it and, standing in the dark, echoing vault, it’s tempting to wonder about its true origins. The eerie feeling of the place is not helped by knowing that during World War One it was used as a mortuary chapel for the bodies of drowned sailors. Emerging once more into the sunlight, we had another reason to be visiting Blakeney today, and that was to meet up with family to celebrate my Mum’s birthday. Having met up for lunch we went on a hunt for eateries to sample the local wares and, passing by just such a contender, we discovered that my brother had experienced a paranormal encounter of his own. The day before, he had decided to take an evening stroll to explore a little as it was their first night there. He had walked past the large, brightly lit windows of the restaurant and paused to do a double take. In the restaurant, seated at a table eating a meal he saw – quite clearly – himself. This is not the first doppleganger witness I’ve spoken to, and I recognised the look of confusion and disbelief. Relating his story the day after the event, he was obviously shaken, and somewhat stuck for how to describe it, let alone explain it. My previous doppleganger witness was similarly unnerved and perplexed, although that encounter was not of the witness’s own image. To be faced with your own apparition, rather takes it to the next level. There are hundreds of reports of doppelgänger encounters spanning many years, but none that I could find in Blakeney. Who knows, maybe we stumbled across a new legend!